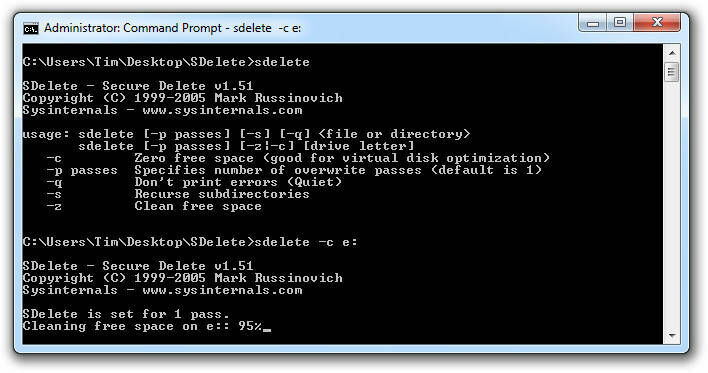 SDelete (Secure Delete) is an application that securely deletes files from your hard drive by overwriting them with patterns of data making the files impossible to recover. You can use SDelete both to securely delete existing files, as well as to securely erase any file data that exists in the unallocated portions of a disk (including files that you have already deleted or encrypted). SDelete implements the Department of Defense clearing and sanitizing standard DOD 5220.22-M, to give you confidence that once deleted with SDelete, your file data is gone forever. Note that SDelete securely deletes file data, but not file names located in free disk space.